7:10 Zach Even-Esh is a successful businessman, coach, and trainer of high-school and college athletes. 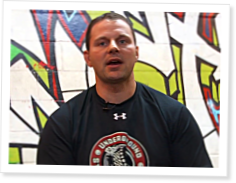 His Underground Strength Gym is located in New Jersey, but athletes come from all over to train with him. Even-Esh came on the show to discuss topics ranging from training ideas and techniques to ways affiliate owners can improve their businesses. He explained how moving and lifting odd objects can add to any strength-training program, and he talked about training athletes both in and out of their competitive seasons. The man from “Dirty Jersey” stressed the importance of full range of motion when CrossFitting and how coaches need to excel at teaching proper technique. Finally, Even-Esh gave a list of resources CrossFitters can use to increase their knowledge of strength and conditioning. Great idea. Of course I'll do it, starting next week.